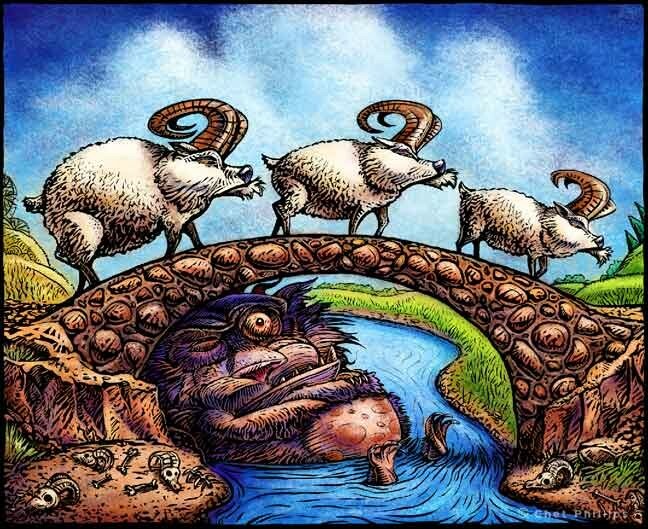 When the Three Billy Goats Gruff trip-trapped across the Troll’s bridge, what order did they cross in? In what other order could they have crossed the bridge? What if there were four goats in the story? Well this is interesting Katie. I think Mr Ellis has sneaked his Goat problem on here! Thats all the ways you can do it for 3 goats. 🙂 These are the possibilities with four goats. Ok, I will give it a go and post it in the box instead . Well done Harry and Ben. Would you use a similar system to find the answers for 4 goats? I’d like to see their thinking posted in the box Mr Ellis for four goats! You could introduce GM – Grandmother Goat! I think I have seen a few patterns. I can predict the number of ways for 5 and 6 goats. Has anyone else noticed anything about the numbers? It goes small,medim and then big but the big goat dot get a coss the bridge. they are all the ways you can do how many is there? I think you’ve got a great method here. Can you try four goats now? Kelsey this is a great try – I’m really impressed in how you’re thinking! Look again and make sure you have all the possibilities!